Discussion in 'Research' started by joshualevy, Jul 20, 2018. Dr. Faustman published a paper [r2] and a poster [r1] that contained results from an extension to her Phase-I trial [r17]. These results have generated a lot of buzz, and the study was complex, so this is going to be a long post with four sections: First, a quick summary. Second, a more detailed discussion of her results. Third, a discussion of the buzz surrounding those results. And fourth, a discussion of where her research goes from here. The [dN] marks mean that there is more discussion about this point at the end of the blog post, and the [rN] marks are references which are also at the end of the posting. The short history is this: Dr. Faustman is trying to cure type-1 diabetes by using BCG, a widely used tuberculosis vaccine. Dr. Faustman published phase-I clinical trial data in 2012, and is now publishing data from an extension to that trial. C-peptide is the FDA, researcher, and industry standard for evaluating cures for type-1 diabetes, and the C-peptide data reported here shows the BCG did not cause a rise in C-peptide levels. These results mean that this extended phase-I trial has worse results/is farther away from a cure, than the initial phase-I study reported years ago. The first phase-I showed tiny increases in C-peptide, but here, no clinically significant increases are seen. A1c data is generally used to evaluate treatments for type-1 (not cures). The A1c data is the best data reported here (an improvement of about 0.8), and is similar to several other treatments already available or in later phases of clinical trials. All the data presented here is based on a very small number of people who actually got BCG (3 people in some cases 12 in others). Furthermore, it is inconsistent. At some points in time the BCG group did worse than the control groups, while at other times they did better. Dr. Faustman had a theory as to why BCG could cure type-1 diabetes. The paper is clear that the A1c results seen here are not caused by this theory. The paper presents a new theory to explain the cause of these results. There is a phase-II trial underway (with results expected in 2023), so we will have more data then. And finally, the primary end point for the phase-I trial was autoreactive t-cells, and this extension to the phase-I trial did not include data on autoreactive t-cells, which means the clinical trial was unsuccessful. You can see that the people treated with BCG had worse A1c numbers for the first two years after the treatment. They then improved noticeably for the next two years, and then gradually increased for the next four years. Overall the patients had worse A1c numbers for the first two years, and better for the next six years. For me, this data does not support the idea that BCG is a cure for type-1 diabetes. It doesn't even support the idea that BCG is a treatment for type-1 diabetes. First and most importantly, A1c data is typically used to measure treatments not cures [d1]. This is for a very good reason: many things, unrelated to a cure, impact A1c numbers. Being more aggressive about insulin dosing, going on a low carb diet, using a CGM, or taking an SGLT or GLP-1 drug can all impact A1c numbers as seen here [d2], but none of them are a path to a cure. On the other hand, the only thing that impacts C-peptide numbers is the body generating its own insulin [d3]. That is why researchers commonly use (and the FDA expects) C-peptide as the end point for clinical trials aimed at curing type-1 diabetes [d5]. Generating your own insulin and maintaining that production is what cures type-1 diabetes, and it is exactly what C-peptides measure. This is an important point and discussed in detail in [r9] (the conclusions of the D-Cure workshop). Second, the data above in inconsistent: worse for two years and better for six. If you are going to argue that the good numbers (3-5 years out) are really caused by BCG, then you have to assume that the bad numbers (0-2 years out) are also caused by the BCG. After all those numbers are closer to the BCG dose. It seems much more reasonable to me to assume that neither the bad numbers nor the good numbers had much to do with the BCG dose. Third, existing treatments have already shown better and more consistent improvements in A1c than are seen here. These are described in more detail in [d2] and [r11-13]. If I wanted to get excited about new treatments for type-1 diabetes, BCG would get in line with the many treatments which have stronger evidence in larger clinical trials [d10]. Fourth, the eight year data is based on 3 people, and the five year data on 12 people, and there are two problems with these numbers. The big, obvious problem is that they are tiny, especially the 8 year data [d6]. The second issue is that more people were added after the end of the phase-I trial. This is unusual. Normally an "extension" or a "follow on" trial simply follows the same group of people (or a subset) for a longer period of time. It's quite unusual to see new patients added after the end of the trial as described by the clinical trial registry. The A1c results also have a serious problem with "results switching" described [d7] and [r16]. The paper reported that at 4 years (the point of highest A1c effect) the C-peptide numbers for the treated patients were "in the range of 2–3 pmol/L." Table 1c in the paper included C-peptide numbers, but the numeric data was not included in the paper or the supplemental materials. My eyeballing of the data is that the control group started off just below 2 pmol/L and the treated group started off just above 2 pmol/L. In terms of measuring progress towards a cure, C-peptide data is the most important data. When the FDA, EMA, or other researchers evaluate this study, it is the key data they will look at [d11]. It shows no progress towards a cure. That is bad news for BCG-as-a-cure research. In addition to A1c and C-Peptide data, the paper also reported on a variety of metabolites. These are various chemical markers of what is happening inside the body. The purpose of these measurements is to try to figure out what was causing the changes to A1c seen in the study. If you care about these details, then I urge you to read the paper [r2]. This study reports on an extension to the phase-I trial, but it does not report on the primary outcome of that study (autoreactive t-cells) [r6]. In the world of clinical trials, this means this extension to the phase-I trial was unsuccessful. The key point is that not reporting on a primary end point, means the trial has failed. The autoreactive t-cells results were involved in the "results switching" described [d7] and [r16]. Until this publication, Dr. Faustman believed that BCG worked by causing the body to generate more TNF, and this TNF caused the body to generate fewer autoreactive T-cells [r17]. Fewer of these bad T-cells resulted in a cure [d9]. She has published a few papers and edited a book on this theory [r10]. BCG lowers A1c by changing the way the body uses glucose, so that it burns more, which lowers blood glucose levels and therefore A1c numbers. The new theory and the old theory are completely different. Among other things, the old theory was based on immunology, while the new theory is based on glucose metabolism. The new theory could replace the old theory, or both could be happening in parallel. Initially, I didn't think this change mattered much. I'm much more focused on the question of effectiveness than mechanism. (Put another way: I want a cure for my daughter, and I don't care exactly why it works, so long as it does work.) But then I realized the implications of this change in theory. BCG has finished a phase-I clinical trial. At this point, most drugs would have two reasons to think they might be successful: the results of their phase-I trial and the results of the previous animal experiments. That means that even if the phase-I trial was unsuccessful, the researcher could still rely on the animal trials for motivation, and try another human trial to capitalize on whatever good results were seen in the animal studies. This is particularly important for BCG because the phase-I trial did not lead to successful C-peptide numbers. However, Dr. Faustman is now saying that the TNF theory did cause the good results in mice, but is not causing the good results in people. So therefore, it is hard to go back to her animal research to get support for her current human research. And the human research itself is not yielding good results [r21]. A big part of the reason this study is important, is because of the buzz it has generated. Therefore, understanding where that buzz comes from is important. In my opinion, the results from the paper don't merit much excitement. The hype comes from the news coverage of the press release, and I think it is always a mistake to react to hype in press releases when the underlying paper does not generate the same level of excitement. This is a general problem in medical research and I'd recommend reading the articles listed here [r14]. Those articles cover the problem from several different points of view. Consider the word "reversal", which is often interpreted to mean "cure". (Compare "drug X reverses disease Y to "drug X cures disease Y". Same meaning.) Reversal is also in that first sentence to refer to results in people. However, in the body of the paper, different forms of reversal are used 5 times (3 times for mice, 1 time to say the results did not include reversal, and 1 time for speculation about reversal). Never in the paper was the word "reversal" used to describe the results in people, yet it was used in exactly that way in the first sentence of the press release. Also, the press release uses the term "near-normal blood sugar levels" repeatedly. Many newspapers interpreted this to be near-cure, and wrote their headlines accordingly. But let me ask you a simple question: If someone has type-1 diabetes and uses a lot of technology and generally works hard at treating their type-1, and has an A1c in the mid or low 6s, would you describe that as "near-normal blood sugar levels"? Maybe. But that says nothing about if they are close to a cure for type-1 diabetes. Saying "near-normal" generates a lot of hype, but a cure is based on not needing to constantly treat your type-1 diabetes. And the study is clear: No one treated their type-1 diabetes any less because of the BCG: not fewer blood checks, not less insulin. Everyone continued their standard care: dosing for what they ate, counting carbs, and anything else that we would associate with type-1 diabetes [d8]. Now take a look at the previous graph of A1c numbers. Does that look stable to you? Does it look durable? Not to me. Quite the opposite, the good results are completely dependent on when you look at the data. Two years after treatment the numbers are bad. Between four and six years they are good. At the end of the study, they are heading back towards where they started. This is neither stable or durable. The press release gives specific A1c data for 3 years and 4 years, and the average for the four year period from 3-7 years. The 4 year numbers are the best found in the study, the 3 year second best, and the 3-7 year time frame the "good years" of the study. However, the 1st and 2nd years (when results are bad) are not mentioned, and the average presented in the press release specifically excludes those years. It's like calculating a child's GPA but excluding their worst grades. Of course it looks good, but it doesn't represent their real level of accomplishment. One answer to this question is simple: a phase-II study is already underway, so we just wait until 2023 for those results to be published. For BCG to be successful as a cure, it needs a specific kind of good news from the phase-II study: C-peptide data which is both statistically significant and clinically significant, and which comes from a large group of people with a good control group. As a treatment (something taken in addition to insulin) then A1c data is enough. It would still need to be statistically significant and clinically significant, and come from a large group of people with a good control group. But all of that is possible from the phase-II trial. Another answer is this: At this point, both publications from the phase-I trial were unsuccessful. While an unsuccessful phase-I trial usually ends the line of research, this is not always true. My guess is that about 20% of the current current phase-II trials are occurring after an unsuccessful phase-I result. So there is always some hope. First is the lack of forward progress, given 15+ years / 34 million dollars [r20]. Fifteen years is enough time to get from the start of a phase-I to end of phase-III trials, and $34 million is more money than most academic researchers can spend on one line of research. But for all that, I don't see any forward progress. In 2003, we had no data on BCG's curative effect on people. Now, we still don't have any positive C-peptide data to answer that question. The hope is that the phase-II trial will answer it in 2023 or so. Second, is the changing target of the research. Successful research tends to have one target ("primary end point"), and gathers more evidence and stronger evidence on that target over time. That is the progress that researchers expect. However this line of research has changed its target repeatedly. When the phase-I study started, the primary end point was autoreactive t-cells [r6]. When the phase-I study ended, the headline data was C-peptides [r17], and now this extension headlines A1c data [r2]. Even worse, this paper conflicts with the previous paper, even though they are both based on data from the phase-I trial. The initial phase-I paper showed: small, good results for C-peptide, no good results for A1c data, and support for the TNF hypothesis. This paper shows no good results for C-peptide, mild, good results for A1c data, and support for a sugar metabolism hypothesis, but not a TNF hypothesis. Good science builds on itself: the first results might be small, but the next results are stronger. But here, the next results are not bigger, they are different. That is not the normal course of scientific progress. Many people, with wildly different viewpoints, reviewed this blog posting. I want to thank everyone who spent time on it. It needed a lot of work, and benefited from every reviewer's feedback. All mistakes are my own. [d1] Consider a simple example: injecting insulin. If you inject more insulin your A1c will go down, but your C-peptide numbers will not change. A researcher who is treating A1c as progress toward a cure will see injecting more insulin as progress towards a cure. That is why researchers measure C-peptide to evaluate progress to a cure. [d2] For instance this slide [r20] presents data from four different groups treated with different type-2 diabetes medicines (two medicines at two doses). All four of these groups dropped the same or more as is seen here. And [r21] shows that simply using CGMs can lower A1c numbers in pregnant women about the same as seen here. And [r22] shows that a new class of drugs (approved in type-2s and being tested in type-1s) called SGLTs lower A1cs about as much as seen here. And the list goes on. The bottom line is that the average improvements seen in this study are similar to the average improvements seen in many other treatments, which are much closer to FDA approval (or already have EMA approval) for type-1 diabetes. When we look at A1c for people who got BCG over the life of the study, it averages about 6.6 which is about 0.8 below the 7.4 where it started. (The result is a little worse (about 0.5) if we compare it to the control group, which started at about 7.1). [d3] As an example, When was the last time your doctor said "If you do X, Y, or Z you will have better A1c numbers next time? We get it all the time. But when was the last time your doctor said "If you do X, Y, or Z your c-peptide number will be better"? Never. This shows both that A1c is a measure of treatment, and why it is not a good measure of a cure. [d5] I reviewed all phase-III clinical trials aimed at curing type-1 diabetes in the last 15 years. These are in the final stage of clinical trials, which lead (if successful) to FDA approval. There have been 11 by my count, testing a total of 4 different treatments. Of these, 6 used C-peptide as their sole primary outcome. None used A1c alone as their sole primary outcome. One used it as part of a dual primary outcome. Four used other measures as their primary outcome. [d6] It was not supposed to be that small. The phase-I trial was supposed to have 12 treated people and 12 control [r6]. However, for reasons never published, the original trial only gave 3 people BCG. [d7] Finally, these A1c results represent what is commonly called "results switching" in clinical trials, and this is very dangerous in reporting results. Results switching is when the researcher says they are going to report one result (and designs the trial to do this), but then ends up reporting on a different result. One of the reasons the FDA has a public clinical trial registry [r19] is specifically so that researchers need to publicly announce what their end points are ahead of time. This prevents them from selecting end points to create success after the data is gathered. Obviously, it is bad when secondary results are switched, and worse when a secondary result is used to replace an unsuccessful primary result. However, in this study we see the worse form of "results switch" where an unsuccessful primary end point (autoreactive t-cells) is not reported, and replaced with a better, but still mediocre, result (A1c) which was previously not part of the study at all! There are several articles on results swapping listed here [r16]. [d8] Compare Dr. Faustman's use of language in the press release with Dr. Bernstein's use of language. Dr. Bernstein uses a low carb diet and aggressive insulin dosing to achieve A1c numbers lower than those reported in Dr. Faustman's research. His target A1c is 4.5, much lower than Dr. Faustman achieved here. However, Dr. Bernstein never refers to curing type-1 diabetes. He is very clear that the low A1c numbers he aims for might be the same as someone without type-1 diabetes, but that is in no way a cure. To put it bluntly: if you think Dr. Faustman's A1c numbers in the mid-6s represents a near cure, then you would have to agree that Dr. Bernstein's A1c numbers in the mid-4s would represent an actual cure, but no one does that. BCG (Bacillus Calmette–Guérin) is a biologic that has been given to over a billion people (in low dose) as a tuberculosis vaccine, and is also approved (in much higher doses) as a bladder cancer treatment. It is a generic drug with a very long record of safety. TNF ("Tumor necrosis factor" or TNF-alpha) is a naturally occurring protein that can cause cells to die. It is involved in the natural regulation of immune cells. "Autoreactive" refers to immune cells that mistakenly attack the body's own beta cells. The destruction of these beta cells leads to type-1 diabetes. This is sometimes referred to as an "autoimmune attack" because the body's own immune system attacks the body itself. Many more details are available here [r10]. [d10] For A1c improvements, my standard (which I think is pretty common among both researchers and the FDA) is that changes below 0.5 are not of importance, changes above 1.0 are definitely important, and numbers between these are of mild importance. So the BCG results (if supported by larger trials) would be in the mild interest area. My sentiments exactly. I’m a realist (not an optimist or a pessimist) by nature, and avoid investing in false hope. From my perspective, Dr. Faustman’s work reeks of false hope. Many of you may be aware of the recent publication and related news coverage of the 8-year long phase I human trial, which shows that the generic vaccine BCG appears to restore blood sugars to near normal in type I diabetics with long standing disease. This research was performed at the Massachusetts General Hospital and Harvard Medical School and published in a peer-reviewed journal, Nature Vaccine, with Dr. Denise Faustman as the principle investor.  The BCG treatment resulted in only moderately low HbA1cs and were marginally statistically significant. Untrue. The new data reports highly statistically significant lowering of HbA1c (p<0.0002) in the BCG-treated long-term diabetics. 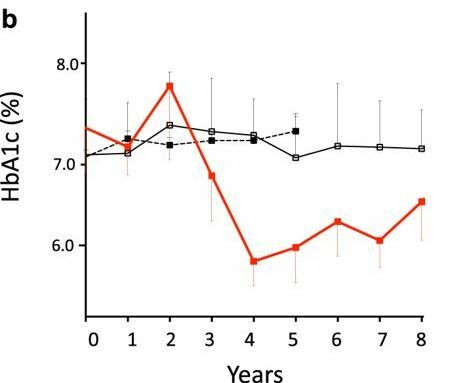 Furthermore, BCG-induced lowering of HbA1c was sustained beyond 5 years in all BCG vaccinated subjects. Hemoglobin A1c of 6.5 is considered the threshold of diabetes diagnosis. The published results showed a durable and statistically significant lowering of HbA1c in the BCG treated group compared to the control group. The BCG treated group started with an average HbA1c of 7.36 and decreased to an average of 6.38 over years 5-8 followed. This is in contrast with the control group’s average HbA1c remaining the same and even slightly increasing from the initial 7.08-7.10 range over the same time period. The HbA1c persistently remained lowered in response to the 2 BCG vaccines and to this day continues to be lowered compared to the placebo treated TID people. This information is in the published paper. As we all know, HbA1c is clinically important because prolonged higher HbA1c levels are directly correlated with greater risks of developing diabetes-related complications.  The newly published data does not account for the natural variability in HbA1c levels over time, which is well known to occur in this population: they tend to improve in people with TID as they age, particularly as they move out of their teens and early 20’s. Untrue. The clinical trial had a simultaneously studied cohort group of untreated type I diabetics that accounted for the natural variability of HbA1c over the entire study. This statement also implies that the BCG treated group may have included people in their teens and early 20’s accounting for HbA1c improvement when in fact the published paper reports that the BCG treated group included nine people at an average age of 45 who were diagnosed between the ages of 22-30 and living with TID for an average of 19 years.  There are no details on the standard of care. Untrue. One person was on a pump in the BCG treated group and no one used a continuous glucose monitor (CGM). There was no change in their therapy regimen as it related to devices such as pumps and CGM devices throughout the trial as stated in the published paper.  All study participants continued to use standard insulin therapy throughout the trial. The published data in this paper does not yet report on the degree or the duration of changes in insulin therapy. However, it is important to point out that semi-annual surveys confirmed that after BCG vaccinations, there were no reports of significant hypoglycemia episodes by any of the BCG treated patients within the years 5-8 followed. This change occurred even with their HbA1c levels lowered and sustained to the near normal range. The placebo group continued to show hypoglycemia events during the same time periods of monitoring. We are all well aware that the recommended target HbA1c has been 7.0 to obtain the best possible blood sugar average while minimizing or eliminating the dangerous lows that often accompany HbA1c values in the low to mid 6.0 range. This is true especially as the years living with the disease increase and hypoglycemia unawareness can develop.  The study only followed a very small number of patients...and must be interpreted with caution. The scientific community uses statistical analysis (relayed in p values) to quantitatively measure the significance of outcomes, and the p values in this study were highly significant. Further, two weeks ago the JDRF issued a very positive public review of a Phase II clinical study using a blood pressure lowering drug in new-onset diabetics of a similar group size.  The JDRF indirectly implies that Dr. Faustman is advocating BCG as a current therapy. Based on the reading of her online materials and our conversations with her, this is not true. The state of this research and that BCG is not yet approved as a treatment for type I diabetes is clearly stated in all of the MGH media materials. The phase I human clinical trial was a double blinded study using the 100-year old generic and safe BCG vaccine. BCG has been known for over 30 years to boost a cytokine in the body called Tumor Necrosis Factor (TNF). It has been published that TNF directly eliminates the auto-reactive T cells that are responsible for autoimmune disease. A surprise finding in this human study was an increase in the beneficial regulatory T cells called T regs to almost normal levels. The T regs are critical for immune balance and decreasing inflammation and the autoimmune response. Even more impressive was the discovery that blood sugar control may have been driven by a shift in the body’s ability to metabolize glucose from oxidative phosphorylation to aerobic glycolysis (a state of high glucose utilization) on a tightly regulated cellular level systemically. In other words, glucose uptake and regulation of this uptake by the cells appears to prevent severe hypoglycemia since the cells stop transporting glucose when the blood sugar is in the normal range. The intent of this phase I human clinical trial was never to get the people with long-standing disease off of insulin with 2 BCG vaccinations. We are not aware that MGH ever made that claim because the trial was not designed to answer that question. There is a six-dose 150 patient Phase II trial currently underway at MGH that is designed to do just that. This early phase I trial’s purpose was to satisfy FDA safety requirements and perform specific analysis to detect any immune system effects and document any clinical changes in the participants, no matter how temporary. Surprisingly, the data shows that the clinical changes have been sustained for many years and the immune system effects are profound. We try to follow many areas of research involving possible treatments that may improve the lives of those living with TID and perhaps lead to a true cure because our children were diagnosed with diabetes in the mid-1990s at 3 years and 18 month of age respectively. We believe that all research should continue as quickly and safely as possible until it rules out if an idea can work or not. With that said, we will stand up and question any person(s) or organization that sheds falsehoods that may be detrimental to the progression of a possible treatment and specifically the ability to obtain funding to continue. In an environment where health care costs are already unaffordable, and our fears as parents that our children may suffer from a deadly hypoglycemic episode or develop long-term complications, these early findings that BCG may be available as an affordable and safe adjunct therapy for normal blood sugar control in humans with longstanding disease, is something to be excited about. Expanding research to include the pediatric population and newly diagnosed needs to be done as quickly as possibly, especially given the impeccable 100-year safety record of BCG. We urge you to contact JDRF headquarters and tell them to engage with MGH on these current and future BCG human trials. And there it is...keep my lab funded: "We urge you to contact JDRF headquarters and tell them to engage with MGH on these current and future BCG human trials." So at the end of the day, both JDRF and Dr. Faustman's lab both came to the same conclusion (the TNF theory was not cause any significant effects in people), but the JDRF got there in about 1/10 the money, and about 1/10 the time. The sad part for me is that some people still believe in her and continue to give their money to a dead end cause!